One of the main reasons I LOVE working at Leeds is the enthusiasm of some of my colleagues. Lots of people give up their time generously and put together very cool events. 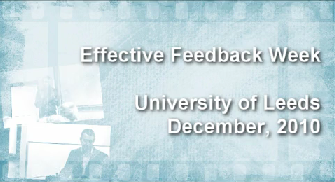 One such event was the Effective Feedback Week which took place mid-December. My colleague Karen invited 3 very cool speakers to talk about their exciting projects which dealt with multimedia feedback. Very cool stuff! Initially I started playing with Adobe Premiere CS4 because of its amazing functionality, but I soon gave up – kept freezing on my 32-bit Win 7 with i3 processor (I am aware of the requirement for 64-bit OS, but it used to be ok a little while ago…).